The making of the creepy thriller Supernatural, ironically, is always full of fun and laughter, reveals the show’s creator. FANS of Supernatural have better get ready to be thrown into an emotional tailspin in the second season. While many would be expecting “something major” after last season’s chiffhanger ending, what they won’t know yet is the emotional depth to which it will go. 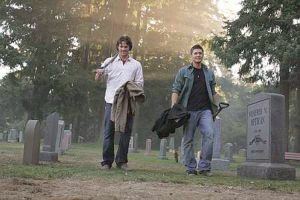 A lighter moment on the set of Supernatural, which, in this case, is a graveyard, with Jensen Ackles (right) and Jared Padalecki – the actors portraying Dean and Sam Winchester respectively. Supernatural creator Eric Kripke, in confirming a significant development in the start of Season Two, says it will cause a major impact on the Winchesters, the family at the centre of the popular thiller about two ghost-busting brothers. “One of the family members dies and they spend the season dealing with the aftermath,” Kripke helpfully notes in a recent phone interview from Los Angeles, California. The death will send the family into “all sorts of dramatic and conflicted directions”. “And they will try to make sense of this demon who destroyed the family, how to hunt it down and destroy it,” he adds. While the show has proven to be a big hit, the people behind the series are mindful of the pitfalls of monotony and repetitions. Thus for the sophomore season, the show’s writers have stepped away from the tested formula – you know, the one in which the Winchester boys drive into town, kill the monsters and leave town – to inject some exciting changes into the story. Well, we’ll judge for ourselves when Supernatural returns for its second season on AXN (Astro Channel 17) this Tuesday. Ever since its debut in 2005, the programme has drawn a sizeable following and it’s not hard to see why. Apart from the fact that all of us should be afraid of things that go bump in the night, one other factor that largely contributed to its success are the gorgeous Winchester boys (Jensen Ackles and Jared Padalecki). The brotherly chemistry between them is fantastic. In the first season, the mismatched siblings Dean and Sam Winchester (respectively) travel across the United States in a black 1967 Chevy Impala solving paranormal and inexplicable events while in search of their father. In the second, the guys still travel in their muscle car looking for demons but things are certain to be more personal now. But, worry not, Supernatural hasn’t gone all dark and full of angst, and given up on its humorous roots. Though it is dead serious about the fight between good and evil, and offers a microscopic look at the demon-hunting family, the show continues to take itself less seriously despite the heebie-jeebies culled from urban myths and legends. Take the interior decor of the motel rooms featured in the show, for example. While it’s decidedly outlandish and certainly odd for the two demon-hunting brothers, the vastly different individuals – Dean is a rascal with great one-liners which he deadpans at the most inopportune moments, and Sam, the sensitive one – seem to fit in with the surroundings. Kripke concedes that each week they do set out to have “wildly different tones”; in one week it may be a psychologically intense drama, in the next a thrilling invasion of body snatchers, and the week after an outright comedy. Just as well the cast and crew really know how to have fun and share a strong sense of camaraderie. “There’s an episode in Season Two where the Winchesters are investigating the haunted set of a horror movie, and we spent the entire episode doing nothing but poking fun at ourselves and all those absurd and crazy things about making the show,” Kripke gleefully reveals. Fun for the team also includes practical jokes and pranks galore on the set of Supernatural in Vancouver, Canada. “Jared and Jensen are two down-to-earth boys from Texas, and they like to laugh a lot. And the crew really love each other and everyone jokes around,” Kripke says. He recalls another scene in Season Two, directed by Kim Manners, that required Jensen and Jared to be in a very small sewer pipe and they had to climb down a ladder. Jensen Ackles with Alona Tal, who plays Jo Harvelle in four episodes of Season Two. Behind the scenes, Supernatural boasts a sunny working atmosphere. Surprisingly, though, when he first started writing about the series, Kripke’s only goal was to “scare the crap out of people”. But as Supernatural evolves, it becomes less about scaring the audience than about the main characters and what they are going through. “I just set out to make a show that was fast and scary and that was it. Then it became deeper and deeper as other writers added to it and improved upon it. I don’t think I set out to create a show where the characters are as relatable or complex as they ended up being. The characters have really taken a life of their own,” remarks the creator. One of the most prominent story arcs in the new season is the constant test on the ties between the brothers. Kripke, 33, himself comes from a tight-knit family – not ghost-hunters, though! – and has an elder brother. “You may feel those deep feelings for someone but you’ll never tell them because you’re a guy ... You can punch each other on the shoulder but you can’t really say how you feel. I sort of understand that,” he says. If it is just about monsters every week, Supernatural would quickly become boring or corny, he reckons. “I think what makes it work is that the show is mostly about family, and that the monsters and creatures and demons and ghosts are just metaphors that illuminate the psychological conflicts of family. All they do is to make the family drama more effective. This theme is universal. Some people believe in supernatural things and others don’t. But everybody has issues with their family. A ghost story with a heart that underlines the universal theme of family, Supernatural brings on those goose bumps while tugging at your heartstrings. Interesting mix, isn’t it? ‘Supernatural’ returns with its second season on Tuesday on AXN (Astro Channel 17) at 10pm. Repeats are on Wednesday (2am), Saturday (11pm) and Sunday (4am). The first season is currently showing on TV3 on Sundays at 10.30pm.